2. Christ explains here to the Pharisees the law, telling them what the sum of the whole law is, so that they are completely silenced both at his speech and his question, and know less than nothing of what the law is and who Christ is. From this it follows, that although unbelief may appear as wisdom and holiness before the world, it is nevertheless folly and unrighteousness before God, especially where the knowledge of the two questions mentioned above is wanting. For he who does not know how he stands before the law, and what he may expect from Christ, surely has not the wisdom of God, no matter how wise and prudent he may pretend to be. Let us therefore consider the first question, namely: What the law is; what it commands and how it is to be spiritually interpreted. 4. As if the Lord would say: He who possesses love to God, and love to his neighbor, has all things, and therefore fulfills the law; for the whole law and all the prophets point to these two themes, namely: how God and our neighbor are to be loved. 5. Now one may wish to ask: How can you harmonize this statement, that all things are to be comprehended in these two commandments, since there was given to the Jews circumcision and many other commandments? To answer this, let us see in the first place how Christ explains the law, namely, that it must be kept with the heart. In other words, the law must be spiritually comprehended; for he who does not lay hold of the law with the heart and with the Spirit, will certainly not fulfill it. Therefore the Lord here gives to the lawyer the ground and real substance of the law, and says that these are the greatest commandments, to love God with the heart and our neighbor as ourselves. From this it follows that he, who is not circumcised, who does not fast nor pray, is not doing it from the heart; even though he may perform external acts, he nevertheless does nothing before God, for God looketh on the heart, and not on our acts, 1 Samuel 16:7. It will not profit a man at all, no matter what work he may perform, if his heart is not in it. 6. From this arises another question: Since works are of no profit to a man, why then did God give so many commandments to the Jews? To this I answer, these commandments were given to the end that we might become conscious whether we really love God with all our heart, and with all our soul, and with all our strength, and in addition our neighbor as ourselves; for St. Paul says in Romans 7:7 (3:20), that the law is nothing but a consciousness and a revelation of sin. What would I know of sin, if there were no law to reveal it to me? Here now is the law that saith: Thou shalt love God with thy heart, and thy neighbor as thyself. This we fulfill if we do all that the law requires; but we are not doing it. Hence he shows us where we are lacking, and that, while we ought really to do something, we are doing nothing. 7. That the Jews had to practice circumcision was indeed a foolish ceremony, yea, a command offensive to reason, even though it were given by God still to-day. What service was it to God, to burden his people with this grievous commandment? What good was it to him, or what service to a neighbor? Yea, and it did not profit the Jew, who was circumcised. Why then did God give the command? In order that this commandment and law might show them whether they really loved God with all their heart, with all their soul, and with all their mind, and whether they did it willingly or not. For if there were a devout heart, it would say: I verily do not know why God gave me circumcision, inasmuch as it does not profit any one, neither God, nor me, nor my neighbor; but since it is well pleasing to God, I will nevertheless do it, even though it be considered a trifling and despised act. Hence, circumcision was an exercise of the commandment, Thou shalt love God with all thy heart. 8. It was also a foolish command God gave to Abraham, to slay his son, Genesis 22:2. For if reason had been the judge in this, both it and all mankind would have come to no other conclusion than this: It is an unfriendly and hostile command, how can it be from God, since God himself said to Abraham that he would multiply his seed through this son, and it would become as innumerable as the stars of the firmament and as the sand by the sea. Therefore it was a foolish commandment, a grievous, hard and unbearable commandment. But what did Abraham do? He closes his senses, takes his reason captive, and obeys the voice of God, goes, and does as God commanded him. By this he proved that he obeyed from the heart; otherwise, even if he had put his son to death a hundred times, God would not have cared for it; but God was pleased that the deed came from his heart and was done in true love to God; yea, it came from a heart that must have thought: Even if my son dies, God is almighty and faithful, he will keep his word, he will find ways and means beyond that which I am able to devise; only obey, there is no danger. Had he not had this boldness and this faith, how could his fatherheart have killed his only and well beloved son? The service of Abraham was pleasing to God, therefore will ours also be, and consequently they killed one child after another. O, how many healthy, noble and beautiful children perished! The prophets protested against this service, they preached, warned and wrote against it, telling the people that it was deception, but all was in vain. Yea, many a prophet lost his life because of this, as the history in the books of the kings shows. 10. But why was this service of the Jews displeasing to God? For the reason that it did not come from their heart, and was not done out of love to God; but they simply looked upon the service, and did it without the command and word of God; but God saith: My dear sirs, I was not concerned about the fact that Abraham offered up his son, but that he proved by this act that he loved me with his whole heart. There must be first love in the heart, then follows the service that will be pleasing to God; for all the works of the law tend to the end thereby to prove our love to God, which is in the heart; which love the law requires, and wall have above everything else. 11. We are also to notice here that all the works of the law are not commanded merely for the purpose that we simply just perform them; no, no; for if God had given even more commandments, he would not want us to keep them to the injury and destruction of love. Yea, if these commandments oppose the love of our neighbor, he wants us to renounce and annul them. Take the example of this, I recently gave you: Moses brought the children of Israel out of Egypt, leading them for forty years through the wilderness, and not one of them was circumcised, although it was commanded them. Where was their obedience to the commandment? Was God not angry with them because they did not obey his commandment? No, there was a higher commandment in force at that time, namely, that they were to obey God who commanded them to come out of Egypt in haste to the promised land. By their marching they daily obeyed God, and God accepted it as obedience; otherwise he would have been angry, in that they did not keep his commandments. Both the need and the love were at hand, which set aside all commandments, for it would have been unbearable to endure the pain of circumcision and at the same time the burden of the journey. Therefore love took the place of the commandment of circumcision, and thus should all commandments be kept in love, or not at all. 12. In like manner Christ excused his disciples, as is recorded in Matthew 12:3-4, when the Jews accused them of transgressing the law, of doing on the Sabbath that which was not lawful to do on the Sabbath day, when they plucked the ears of corn and ate them. Then the Lord gave them to understand that they were doing no wrong, as if to say: Here is no Sabbath; for the body needs food, necessity demands it; we must eat, even though it be on the Sabbath. Therefore the Lord cited the example of David, which he laid before the Jews, and said, “Have ye not read what David did; he and they that were with him, when he was an hungered, how he went into the house of God and ate the shew bread which was not lawful to eat, nor for those that were with him, excepting for the priests?” 1 Samuel 21:3f. Then David ate the bread, though he was not a priest, because hunger pressed him to do it. Neither did Ahimelech the priest violate the law in giving the bread to David, for love was present and urged him to give it. Thus even the whole law would have had to serve David in his need. 13. Therefore, when the law impels one against love, it ceases and should no longer be a law; but where no obstacle is in the way, the keeping of the law is a proof of love, which lies hidden in the heart. Therefore ye have need of the law, that love may be manifested; but if it cannot be kept without injury to our neighbor, God wants us to suspend and ignore the law. True, I am required to read my prayers, hold mass, or say penance; but now on the other hand, a poor man is here; he needs my help and I should come to his rescue. God commanded me to do this; but the others man devised and instituted. I will let the mandates of men go, and will serve my neighbor according to God’s commandment. 15. However, very seldom do we think that the precious service of holding mass and reading prayers should be put in the background; and such a humble service, as you regard it, should have the preference. But what is the reason? The reason is that these dream-preachers, who have nothing to present to us but the ordinances of men, have made us so timid and fearful that we came to the conclusion, if we did not regulate ourselves in everything according to their preaching, heaven itself would fall. Yea, they would rather let ten poor people starve than fail to say one mass. We find even to-day many monks or priests who rather let a poor man freeze, than violate their statutes and ordinances. So lamentably and miserably have they been deceived by their godless preachers and teachers, and by their superiors, who with their statutes and devilish ordinances have drawn, and are still drawing, them away more and more from the law of God to our own notions. 17. Do you want to do something pleasing to God, then do it out of genuine love. That the Jews practiced circumcision, fasted much, prayed much, and performed other like services, was not pleasing to God, for it did not come from the heart, as this commandment requires: Thou shalt love God with all thy heart. Thus it will be also with you, even though you should belong to the Carthusian friars, or to a still more exacting order; all would avail nothing, if you had not the love of God. From this you are to conclude, all works are nothing, that do not originate in love, or are against love. No commandments should be in force, except those in which the law of love can be exercised. 18. From this it now appears what a misleading calling that of the monks and priests is, in that they wish to merit heaven through their works alone, and they also bind the people to do good works, in order that they may thereby merit heaven, which is a cursed and godless service. Hence, as already stated, the law is to be only an exercise to prove our love; otherwise, aside from love, God never inquires about works, no matter how excellent they are. 19. You can now see how many people know what the law means: Thou shalt love the Lord thy God with all thy heart, and thy neighbor as thyself. Surely they are few who know it, and fewer still who keep it. How can they keep that which they do not know? We are blind and our nature is totally blind, and so is also human reason. It knows nothing so imperfectly as that which the law of God requires. 20. Now here Christ shows the Pharisees and the Scribes a twofold kindness. In the first place, he dispels their blindness and teaches them what the law is. In the second place, he teaches them how impossible it is for them to keep the law. Their blindness he dispels, in that he teaches them what the law is, namely: that love is the law. Human reason cannot comprehend this nowadays any more than the Jews did then, for if it had been possible for human reason to comprehend it, the Pharisees and Scribes, who at that time were the best and wisest of the people, could have understood it; but they thought it consisted alone in performing the external works of the law; in giving to God, whether it be done willingly or unwillingly; but their inward blindness, their covetousness, and their hardened heart they could not see, and thought they thoroughly understood the law and were fine fellows, holy and pious people; but they stood in their own light. For no one is able to keep the law unless his nature is thoroughly renewed. 21. Therefore consider it an established fact that reason can never understand and fulfill the law, even though it knows the meaning of the law. When do you do to another what you want him to do to you? Who loves his enemy from his heart? Who loves to die? Who willingly suffers disgrace and shame? Dear sir, point me to a man who enjoys to have a bad reputation or to live in poverty! For nature and human reason flee entirely from this, are afraid, terrified and shocked; and if it were possible, as far as it were in their power, they would never suffer such misfortune. Human nature alone will never be able to accomplish what God in this commandment requires, namely, that we surrender our will to the will of God, so that we renounce our reason, our will, our might and power, and say from the heart: Thy will be done. And indeed, nowhere will you find a person who loves God with his whole heart and his neighbor as himself. It may indeed happen that two companions live friendly together; but even there hypocrisy is hidden, which continues until you are wounded by him; then you will see how you love him, and whether you are flesh or spirit. This commandment therefore requires me to be friendly with all my heart to him who has offended me; but when do I do this? 22. 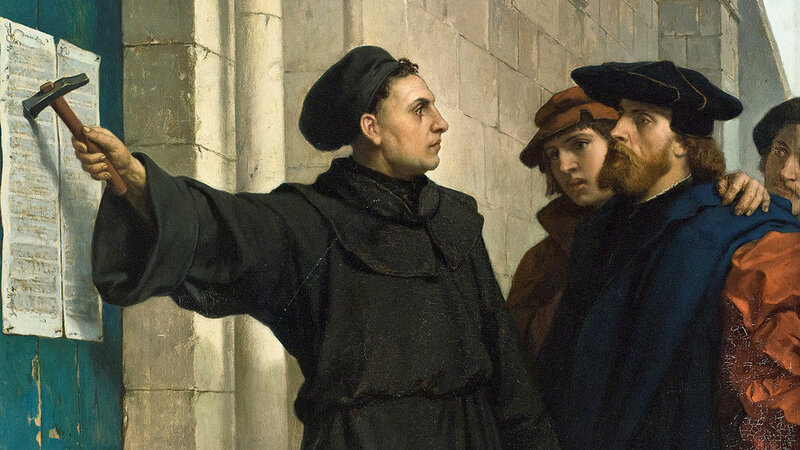 Thus Christ desires to show us that we preach the law rightly, only when we learn from it that we are unable to fulfill it, and that we are the property of the devil. This we learn from experience, and it is shown now and then in the Scriptures, especially by St. Paul when he says in Romans 8:7-8: “Because the mind of the flesh is enmity against God, for it is not subject to the law of God, neither indeed can be,” and it follows, that they who are in the flesh cannot please God. 23. Hence, take to thyself this commandment: Thou shalt love the Lord thy God with all thy heart, and think upon it, contemplate it, and search what kind of a law it is; how far you are from fulfilling it, yea, how you have not yet even made a beginning to suffer and to do from the heart what God demands of you. It is pure hypocrisy, if anyone wants to creep into a hiding-place and think: Oh I will love God. Oh, how I do love him, he is my Father! How gracious he is to me! and the like. Yes, when God does our pleasure, then we can easily say such things; but when he sends misfortune and adversity, we no longer regard him as our God, nor as our Father. 24. True love to God does not act in this way, but in the heart it thinks and with the lips says: Lord God, I am thy creature; do with me as thou wilt; it matters not to me. I am ever thine, that I know; and if thou desirest, I will die this very hour or suffer any great misfortune; I will cheerfully do so from my heart. I will not regard my life, honor and goods and all I have, higher and greater than thy will, which shall be my pleasure all my days. But you will never find a person who will constantly regulate himself according to this commandment; for the whole life you are living in the body, in the five senses, and whatever you do in your body, should all be so regulated as to be done to the glory of God, according to the regulations of this commandment, which saith, “Thou shalt love the Lord thy God with all thy heart, with all thy soul, with all thy mind.” As if Christ said: If you love God with all your heart, with all your soul, and with all your mind, then nothing will be lacking; you shall experience it in your daily life, namely: when everything you do, whether you wake or sleep, whether you labor or stand idle, whether you eat or drink, is directed and done out of love to God from the heart. In like manner your mind and thoughts will also be directed wholly and entirely to God, so that you will approve of nothing you are not certain is pleasing to God. Yea, where are those who do this? 25. And this part where he says, “With all thy mind,” argues powerfully against the writings and teachings of man, upon which he especially depends, and thinks thereby to obtain a merciful God and merit heaven. Such imagination of the human reason draws us in a wonderful manner from this commandment, so that we do not love God with all the mind; as has been done hitherto, and is still done at the present day. For these priests and monks think nothing else than that God is moved by the mass and by other human inventions; but he abhors it and does not desire it, as is said in Isaiah 29:13: “In vain do they serve me, because they are teaching such doctrines which are only the commandments of men.” Matthew 15:8-9. The commandment here requires you to consider nothing good that is against God and against everything he has commanded or forbidden. It thus requires, you to give yourself wholly and entirely to him in all your life and conduct. 27. From this it appears clearly that we are all alike, and are one in the inner wickedness of the heart, which the law reveals, when we look into it rightly. Therefore we might well say, If one is good, then all are good. Therefore no one should accuse another. It is indeed true that in public and gross sins there sticks a deeper sin; but the heart is alike bad, unless it be renewed by the Holy Ghost. But what shall I do when I once recognize my sin? What does it profit me? It helps me very much, for when I have come thus far, I am not far from the kingdom; as Christ says to a scribe in Mark 12:34, who also knew that the works of the law were nothing without love. 28. But what shall we do to get rid of our bad conscience? Here follows now the other part of this Gospel, namely, who Christ is and what we can expect of him. From him we must receive and secure freedom from a wicked conscience, or we shall remain in our sins eternally, because for this purpose is Christ made known and given by the Father, in order that he might deliver us from sin, death, from a wicked conscience, and from the law. 29. We have now heard what the law is, and how through the law we come to the knowledge of sin; but this is not enough, another has a work to do here, whose name is Christ Jesus; although the first, the law, must indeed remain; yea, it is necessary. For if I have no sense of my sins, I will never inquire for Christ; as the Pharisees and scribes do here, who thought they had done everything the law commanded and were ready to do yet more; but of Christ they knew nothing. Therefore, first of all, when the law is known and sin revealed through the law, it is then necessary that we know who Christ is; otherwise the knowledge of sin profits us nothing. 30. But the law is known, when I learn from it that I am condemned, and see that there is neither hope nor comfort anywhere for me, and I cannot even help myself, but must have another one to deliver me. Then it is time that I look around for him who can help, and he is Christ Jesus, who for this purpose became man, and became like unto us, in order that he might help us out of the mire into which we are fallen. He loved God with all his heart and his neighbor as himself, and submitted his will to the will of his Father, fulfilled the law in every respect; this I could not do and yet I was required to do it. Therefore, he accepts him; and that which he fulfilled in the law, he offers me. He freely gives me his life with all his works, so that I can appropriate them to myself as a possession that is my own and is bestowed upon me as a free gift. He delivers us from the law, for when the law says, Love God with all thy heart, and thy neighbor as thyself, or thou wilt be damned, then I say, I cannot do it. Then Christ says: Come to me, take me and cling to me by faith; then you shall be rid of the law. 32. But you must take heed, that you do not undertake to secure this faith in Jesus Christ by your own works or power, or that you think lightly about this matter; for it is impossible for the natural man; but the Holy Spirit must do it. Therefore beware of the preachers of self-righteousness, who simply blabber and say: We must do good works in order to be saved. But we say that faith alone is sufficient to this end. Our good works are for another purpose, namely, to prove our faith, as you have already frequently heard from me. What think ye of Christ; who is he and whose Son is he? But their answer, in that they say, He is the son of David, the Lord rejects and obscures their answer and refers to a passage from the Psalm, in order to leave them in doubt; so that no one is able to answer him a word. 34. However, when David calls Christ his Lord, in that he says in Psalm 110:1, “But the lord said unto my Lord, ‘Sit thou on my right hand until I make thine enemies thy footstool,’” it is to be understood that David speaks of him both as God and man, for according to the flesh alone he was the son of David. Paul also joins these two when he says in Romans 1:1-4: “I am called to be an apostle, separated unto the Gospel of God, which he promised afore through his prophets in the Holy Scriptures, concerning his Son, who was born of the seed of David according to the flesh; who was declared to be the Son of God with power, according to the Spirit of holiness, by the resurrection from the dead.” But it is something to know that Christ is Lord; for this has might and power and is especially comforting in the time of affliction. But concerning this I have said more elsewhere and will therefore now close, and pray God for grace.